Qualicare fully supports the NHI concept of universal access to quality, accessible, equitable and appropriate health care for all. It is in this light that we have carefully reviewed the white paper on National Health Insurance and highlight areas where we believe flawed philosophies might delay or even derail what could be a successful future idea. It is said that healthcare will not be outsourced to the private sector for management. 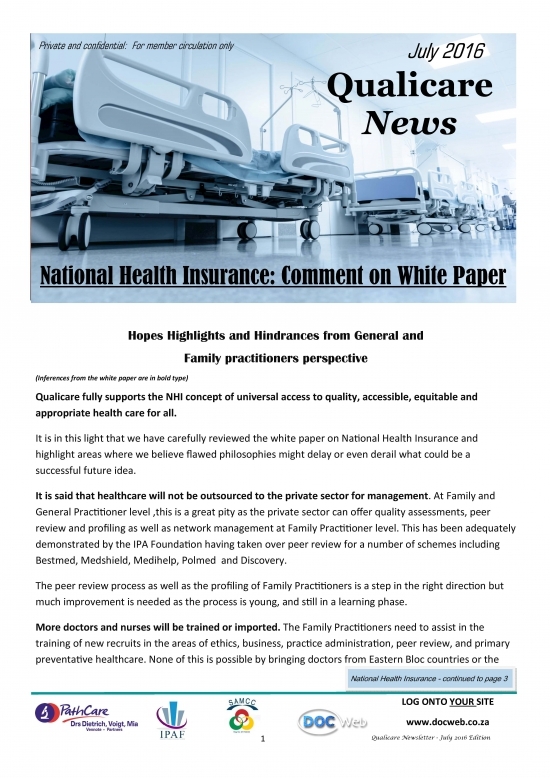 At Family and General Practitioner level ,this is a great pity as the private sector can offer quality assessments, peer review and profiling as well as network management at Family Practitioner level. This has been adequately demonstrated by the IPA Foundation having taken over peer review for a number of schemes including Bestmed, Medshield, Medihelp, Polmed and Discovery. The peer review process as well as the profiling of Family Practitioners is a step in the right direction but much improvement is needed as the process is young, and still in a learning phase. More doctors and nurses will be trained or imported. The Family Practitioners need to assist in the training of new recruits in the areas of ethics, business, practice administration, peer review, and primary preventative healthcare. None of this is possible by bringing doctors from Eastern Bloc countries or the Caribbean into the system. The cultural mismatch between these doctors and blue-collar South African workers has resulted in numerous complaints to statutory bodies. Rather reopen the training colleges and increase the capacity for more medical students by opening new universities, whilst maintaining the standards for international recognition. These have, sadly diminished in our current places of medical learning. Furthermore the concept of nurses working for agencies, is the scourge of the healthcare sector, both private and public. With agency nursing, comes indifference to patients, overworked nurses who moon light with agencies during their off times, and overall substandard patient care, when they report to their day jobs. Private practitioners will be contracted but will need to be accredited. There appears to be a fixed idea that practitioners must leave their current primary practices and work in in NHI clinics. We believe that this is flawed philosophy and suggest that the best place for doctors is in their primary care practices within the community they serve. The IPA Foundation utilises an accreditation document for private practitioners to self- report in to the Foundation on approximately 50 parameters. This is praiseworthy and a step in the correct direction. Doctors are encouraged to download the accreditation form from the Qualicare website and register your practice for accreditation with IPA Foundation. A certificate of need may be enforced. We believe that this is a blunt and unnecessary tool which will result in attitudes similar to those which currently compel doctors to perform two years of community service. Furthermore a certificate of need appears to be a violation of the doctors rights to earn a living and practice where he desires. This threatened, heavy-handed management of the profession will no doubt evoke disdain from Family practitioners, and possible indifference to the entire process. A national health service will be run primarily by public sector doctors. Currently public sector doctors have not been exposed to any market forces of supply, demand, patient satisfaction, and public voting with their feet. In contrast the private sector is acutely aware of such constraints and rewards. The public sector needs to be trained in handling patients in a commercially satisfactory manner which accurately reflects the private sector’s current success. Special training in patient expectations and satisfaction with service, for public sector doctors, nurses and reception staff will be beneficial, and can be offered by local organisations like Qualicare. The White Paper deals extensively with a code of conduct for the National Health Insurance staff. Respectfully it is pointed out that the only ethical conduct which regulates the profession is that of the Health Professions Council of South Africa. The Private sector do not have to have a written code of conduct as if they behaved poorly, doctors will lose support of their patients , who , as mentioned , would merely vote with their feet. Payment will be along the lines of Capitation and DRGs. Unfortunately in Family practice there is insufficient data to ascertain an effective capitation rate which does not anti-select against the PHC doctors. More information is required including practice running costs before a practice capitation rate can be safely set. The private sector may only provide complimentary care. There seems to be a decision taken by the social engineers of NHI, at worst to eradicate the private sector and at best, to marginalise them. Here we include the progressive marginalisation of the Private Primary Care practitioners, who will be the main stay of a future NHI. Far better would be to work constructively with the best elements of the private sector, learn from them, and vice versa, so that a new dispensation can be grown , slowly , from the ground upward. The Big Bang approach which is inferred from the NHI documentation seems unwise, especially in the light of the current running of health care and it’s finances to date in the RAF, COIDA, HPCSA, Public Hospitals and Day Hospitals. The state can learn much from the private sector in this arena, whilst eliminating Fraud, Waste and Abuse, which unfortunately marks both the private and public sectors healthcare. Operation Phakisa seems to have worked from a pre-determined script to invent an ideal clinic where PHC doctors would be under a local matron. This is a recipe for disaster, and has not worked in hospitals in the past. PHC doctors need to report to a more highly qualified peer, who shares similar insights into patient care. Up to now the NHI clinic pilots have not succeeded with any more than approx. 200 doctors contracting with the State. The doctors seem to be unimpressed with the remuneration, clinic structures, and inexplicably, many of the private sector doctors in the relevant areas seem to have been marginalised, and have not even been approached. Medication, pathology services, equipment, surgical consumables, blood and blood products. Why not permit the private sector with its knowledge of the free market to assist by offering more sound systems, with less beaurocracy, not more red tape, which seems to haunt the white paper. (We have all heard of that circumcision story of R 600 in State versus R 15,000 in a private hospital). Access to health will be based upon severity of illness and progressive realisation of resources. This would be fine if persons who do not qualify for state healthcare can purchase care privately, but implosion of the private sector into merely complimentary or even limited supplementary care coupled with the statement that access to health will be based upon severity of illness and progressive realisation of resources, effectively sounds the death knell for attracting and retaining local and international medical and entrepreneurial talent to remain in RSA. The fact that the current average Mr Private still prefers to consult with a private GP rather than go to a state clinic says it all for now. The State concept of universal access to healthcare for all is warmly embraced by us. State however needs to revise its 1994 stance on the future of private healthcare, become more pragmatic and align with the World Bank, and accepting the excellent parts of the Priavet healthcare sector ( such as the Family Practitioner practicing form his own rooms, within the community. RSA should move through a system of Social Health Insurance before implementing NHI. Lessons should also be learned from Holland, Belgium, Portugal and the UK, where a robust private sector runs in collaboration with the states NHI offering. State needs to acknowledge the currently successful (but overpriced and under-regulated) private sector, whilst learning from that sector’s successes. Engineer out / regulating out that which amounts to failures, avarice, fraud, waste and abuse. Multiple dysfunctional regulators with a litany of dismissed CEOs, COOs and other senior office bearers, all of which undermines confidence and trust in a future NHI. There has never been a more important and essential time for Private and State to work together on a noble project of healthcare for all, and the General Practitioners of RSA and Qualicare and IPAF are a beacon of hope to follow in this troubled industry and during these troubled times.